Is hail a good thing... or a bad thing? Why I am glad I am not in charge of the world. I love hail. Or at least I used to. During our early years of marriage, I would roof houses on the side to make our extra money for Christmas and birthdays. For a time, I even supported my family by roofing houses. So hail was a blessing to us. I remember the time when money was tight and I actually prayed for God to help us. 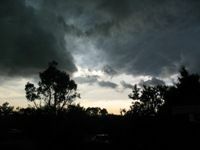 That week it hailed and I stood on the porch with my son thanking God for providing for us. And I still think how happy roofers are when it hails. I hate hail. My wife comes from a long line of farmers. Her parents lease out their farm now but still depend on the crops for their income. Two weeks ago, it hailed out their wheat. Half of this year’s wheat income gone. Farmers hate the same hail that roofers love. So I have wondered should I love – or hate – hail. Should I pray for hail because roofers need to eat? Should I pray for it not to hail because farmers need to eat? I wonder what I would do if I were in charge of the world. How would I know what was best? And when should I make it hail? Or make it stop? Would I be so selfish that I would only do what is best for me? So I am glad to be a Christian. I don’t have to worry about how to run the world. That is God’s job. I recognize that and I submit to that. I ask him for what I believe I need, but I can trust him to do what is best for me, and for everyone else. I do not even have to understand how it will all turn out. What a relief. There is great peace in realizing there is someone greater than me – greater than you – in charge. And God does know what is best. He loves us and he will take care of us. If you would like to visit more about letting God be in control, write me at steve@hopeforlife.org or join the blog discussion at www.hopeforlife.org. "What to Do about Hail" by Steve Ridgell is licensed under a Creative Commons License. Heartlight encourages you to share this material with others in church bulletins, personal emails, and other non-commercial uses. Please see our Usage Guidelines for more information.